DONATIONS! Thanks to “Got ‘em on Live” for their annual donation. Also a big thanks to David Mohr for the donation of a framed photo of Confederate Veterans in 1932. The History Center recorded 52 visitors in December and 77 visitors in January. We had 47 in attendance at the December potluck and 40 in attendance at the January meeting. The gift shop took $102.85 in December and $180.85 in January. The cookbook continues to sell at a steady pace. The History Center was also used by Got-‘em-on Live Bait Fishing Club and the UDC-Fort Fisher Chapter, and the Committee for the Carolina Beach Walk of Fame. No new members in the last two months but both Pat Bolander and Jackie and James Kraus have upgraded their memberships to Lifetime! Please NOTE! 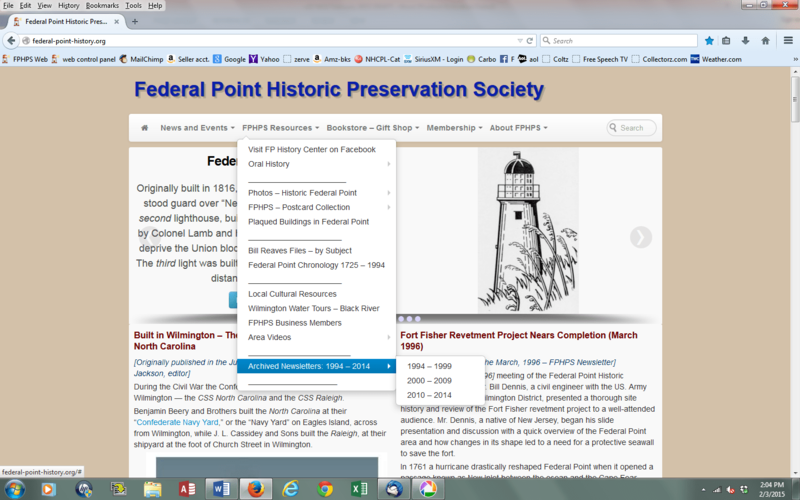 All our monthly Society Newsletters for the past 20 years are now available on our web site.Go to Federal-Point-History.org. From the main menu choose FPHPS Resources and then choose Archived Newsletters 1994-2014. This is a GREAT resource that Andre’ has spent hours and hours scanning and formatting and it’s a great relief that all our hard work is now archived digitally. Now, whenever you visit our website, you’ll be seeing selected stories of historical significance that have been published in Newsletter over the past 20 years. We’ll be periodically posting these stories on our front page using the text of the original Newsletter article – with the addition of new web-links, images and reference to related resources.